Consider this scenario. I'm sitting alone in a corner at Q Go Ramen. I'm disturbingly giddy taking photos of my noodles. There is a Mandarin-speaking couple sitting next to me. Due to the nature of the table configuration, they are practically encroaching on my personal space. They really have no idea what the heck I'm doing. How did I end up in this situation? Well, I'm no stranger to eating alone. I do it all the time for lunch. However, for some reason or another, dinner seems different. Originally, I was going to try out Hida Takayama in Robson Market. But I had to push those plans a few days forward since I was going to meet Kim for lunch. Thus, I was alone, still hungry and craving ramen. So as mentioned, I was seated in a corner of sorts, so at the very least, only the immediate people around me could stare and point... 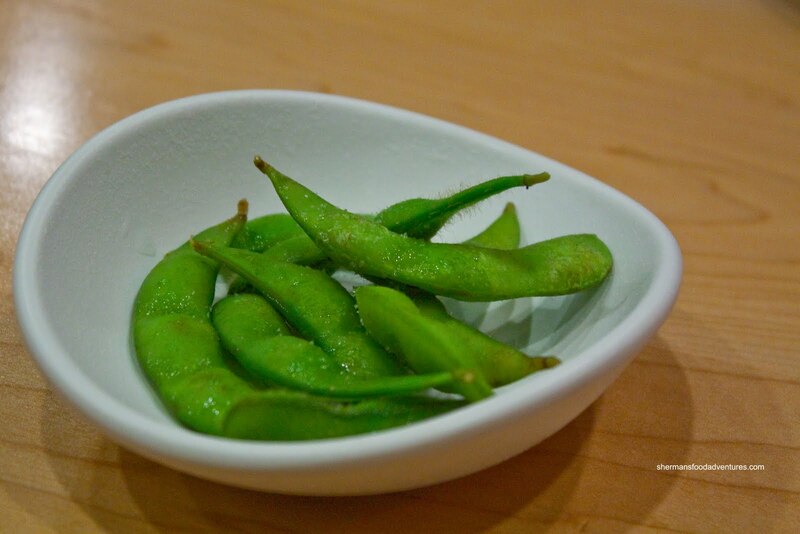 In addition to water and utensils, the friendly server presented me with some complimentary Edamame. A nice touch in my opinion. Undaunted by a free appy of sorts, I decided to start with some Gyozas. 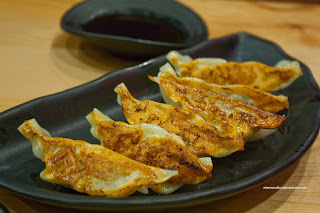 I wasn't expecting much; yet these gyozas were pretty good. The best part was the dumpling wrapper itself. It was thin, easy to chew through while still retaining some chewiness at the same time. The filling was also quite pleasant being non-gritty; yet still meaty. The filling was a tad on the bland side; however, I did get some sweetness and that's what the accompanying dip is for anyways. 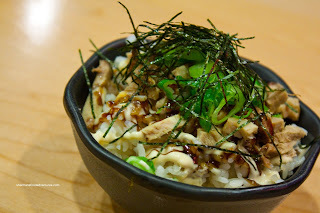 Again, not satisfied by only one appetizer, I went for a Mini-Chashu Don as well. Hey, I was hungry! I found the rice to be on the drier side while not terribly so. I prefer this over mushy rice any day. The chashu on top was also a bit dry. A bit more fat would've been better. I found that there was not enough sauce for the amount of rice. After awhile, I was only eating white rice with no more meat nor sauce. When I did get sauce, mayo, green onion and nori, the rice did taste okay. Overall it was acceptable. Now for the main-event. I went for the Shio Ramen with a side of corn. Included in the basic ramen was 2 slices of chashu, wood ear mushrooms, bean sprouts, green onion and half of a ajitama egg. For the price ($7.95) and considering the portion size, I consider this to be a decent value in comparison to other ramen joints. Now of course value and taste can be mutually exclusive things. In this case, I asked for fatty broth and meat. As you can clearly see, there were a lot of "floaties" intermingled with the oil slick on top. Unhealthy? Yes. Flavourful? Generally. I say generally because the broth was not a rich as I was expecting. It wasn't silky and lacked depth. No "porkiness" or slight thickness we would find at Kintaro. Sometimes I complain about too much salt in a shio broth such as the case at Sanpachi or Menya. However, I felt the broth here could've used more salt. With that being said, the broth was acceptable. The noodles were past al dente, being on the softer side. As for the chashu, it was fatty alright, pretty much melting-in-my-mouth. So the texture was good and the flavour was decent too. I really liked my half-ajitama egg (not a whole one...). It was perfect. Of course not everything was perfect and honestly that would not be possible. I would say that their broth does not match up with Kintaro and Santuoka. 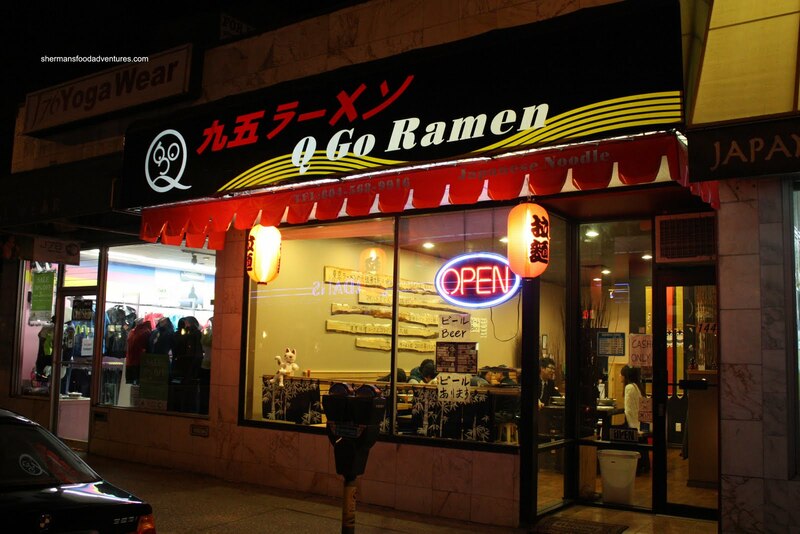 Yet, considering the price and portion size, I would say Q Go is an okay place to go for Ramen outside of Robson Street. Although, if one is mobile, head over to Kintaro and Santuoka. OK, it seems there is some level of inconsistency. The day I went, the egg I was given was whole, not split. Other reports mention it is split in half. I guess that is part of the (in)consistency? But, yeah, by the time you go there, you would have passed by some other ramen shops and this might not be choice number 1. Kim, definitely some inconsistencies. An okay place to go; but there is better. shokutsu, I just read the comment. Interesting how this person only has one "review". Anyways, I make pork bone soup at home all the time and in fact, I have some in my fridge right now. He is partially right on the MSG but... there are other variables as well. 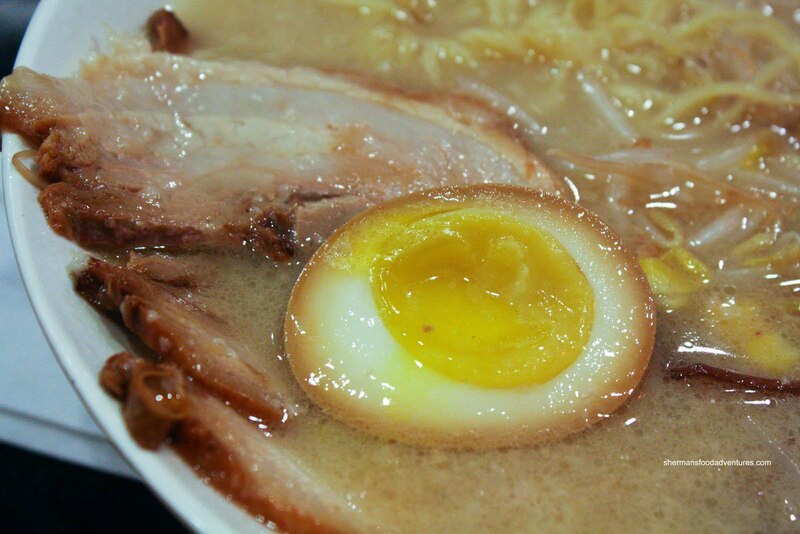 Such as the type of pork bone, how much pork bone, how long it simmers for and other ingredients such as veggies. I use pork neck bone myself and the bone marrow really helps "thicken" and develops richness. Adding fatty pork is another thing that helps of course. Also, I don't "boil" the broth, rather than let it simmer. 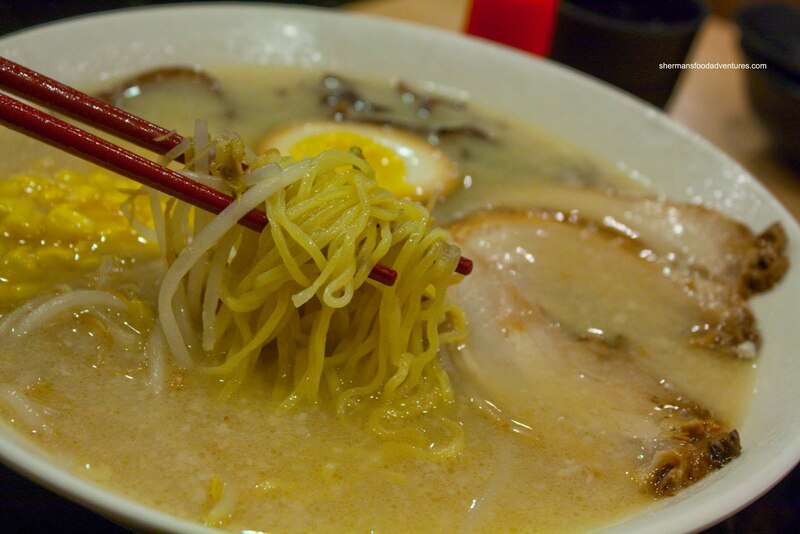 In terms of ramen broth, chicken can be added as well with onion and kombu. Hence, there are plenty of ways to develop umami and natural sweetness with little help from MSG. So unless all these years of making pork bone soup at home that I haven't learned a thing or two, MSG is not a necessity to make great tasting broth. Of course salt is needed, but that is a given. I actually like the broth at Q Go; might not be deep as some other ramen-ya's but it is flavourful (unlike the broth at the Benkei on Broadway/Cambie which tastes very diluted). Texture of the noodles might be a little past al dente, but I find this acceptable for noodles of this thickness. 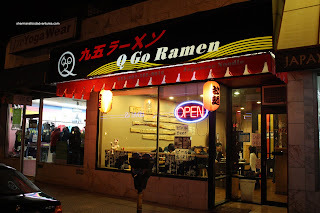 However, as you always say, taste is personal, and I find the ramen here to be pretty good. 3) The one time I ordered the gyoza here, they looked terrible (bottoms were barely grilled and the wrappers were a non-translucent white). The one's in your photo look much better. Anyways, just my two-bits. Keep up the great blogs! Oil, very valid points and nicely said. Taste is very personal and it is what it is. I do think there is inconsistencies here. If they can work that out, I'm sure it will be for the better.